Start a syndicate with your friends, family and/or work colleagues and everybody could be celebrating! With more players you can share the cost of a larger entry which means you have more chances to win! Cost per share - decide on how much each person will pay. Select an entry type - you can select from a QuickPick, a System Entry or even a mark a coupon with your groups favourite numbers. Purchase your entry at Camberwell's Tatts Outlet. 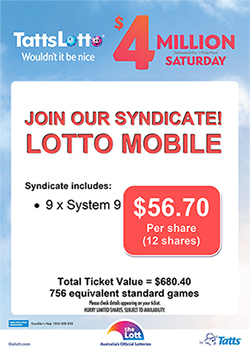 Camberwell Lotto & Mobile offers more than 50 syndicates weekly and more than 200 during superdraw or big jackpot from OZ Lotto and Powerball. We offer wide range of syndicates from system 7 to system 20 min 7 shares to 32 shares.